Are you having difficulty with plugged or “fried egg” bunker shots? Hi Sean, I’ve been having a lot of trouble with plugged bunker shots or “fried eggs” as I’ve heard them called. Can you give me a few pointers to get out of the bunker a little easier? For almost all bunker shots, I’m a huge advocate of using the bounce of the club to assist you. However, in the case of a plugged ball, I don’t want the bounce to be the first part of the club to enter the sand. With this particular shot, we need to dig the ball out of the lie - so it’s paramount that the leading edge of the club enters the sand first. If you use the bounce, it will be very difficult to get the leading edge under the ball and dig it out. For this particular lie, we want the leading edge of the club to enter the sand first. You will play this shot with a square clubface, because it will be easier to get the leading edge underneath the ball. There is no need to open the clubhead for this type of shot. We need to drop the clubhead steeply into the sand, about an inch behind the ball. From a setup perspective, I’d like you to play this shot with the ball in the center of your stance, or just slightly back in your stance. For a right-handed golfer, make sure there is more weight on your left side (lead side) at setup. The weight distribution should be around 60% - favoring your left side. You need a very steep angle of attack on this particular shot compared to other bunker shots. I want you to feel like you’re not creating much width on your backswing, but instead creating an up and down movement (i.e. that you’re picking the golf club up). This will make it easier to create that steep angle of attack. I don’t want you to worry too much about following through for this particular shot. If the club happens to stick in the ground, that’s okay. I just described a plugged ball for a level stance where there isn’t much incline or slope. However, most plugged lies that we encounter are under the lip of a bunker, meaning our stance is very uneven and that we need to brace ourselves against the slope to hit the shot. Everything I described for the setup in the previous shot will remain pretty much the same, with the ball position being in the center, to slightly back in the stance. Due to the uphill slope, you’re going to have to favor 60% of the weight in your lead side - or maybe a little more depending on the severity of the slope. I want you to feel like you’re making a backswing with very little width; it should feel like you’re picking the club up and creating an “up and down” motion. This will make it easier for you to have a steep angle of attack, driving the leading edge of the club into the sand about one inch behind the ball. I don’t want you to be too concerned with follow through; if the club happens to stick in the ground after you hit the shot, it’s okay. Finally, one thing a lot of good players do with this type of stance and lie is that they fall back once the club has entered the sand. This will assist you, helping the ball get out of this lie and up onto the green. Watch the tour players on TV; you’ll notice that when they hit a plugged lie on an upslope, they will fall back to help them get the ball in the air easier. If you’d like something as a reminder when you go to practice bunker or golf course to help you hit plugged bunker shots, then download the bonus below. You'll receive a free step-by-step checklist that shows you the step-by-step process to help hitting these types of shots. The yips, particularly with the putter is something most of us probably have experienced at one time or another. Whether it's in the middle of your round or that last putt on eighteen with everything on the line, it's just not the pro's that experience them. I've asked my good friend Dr. Greg Cartin, a golf performance coach who's helped golfers of all skill level including PGA Tour and Web.com Tour players talk about the putting yips. He shares his experiences with how to over come this four leader word and start getting in the correct mindset to make more putts. If you enjoyed this this blog post and want to get in touch with Dr. Cartin, the best way to do so is through his website Mindful Mindset. Take it away Dr. Cartin. The Yips – it’s one of the dreaded 4-letter words in golf. Those of us who have experienced them know the familiar sensations that the mere mention of the word can elicit. First, you have a large putt that you need to address. A smooth stroke and solid read leaves you with a little less than 3 feet. You’re supposed to make these shorter putts 100% of the time, just like on TV - right? Your alignment seems good, your mind is clear, and out of seemingly nowhere you practically hit a shank with the flatstick! It’s as if someone took over your arms at the last second and decided it would be funny to maneuver the putter in a way to make you barely strike the putt on the face. What are some of the causes of this terrifying act, and how can we best get ourselves in a mindset to prevent it from recurring? These are the questions to be explored in the following blog post. Why is it that we often have a long, smooth, free-flowing stroke on long putts - yet when we get to 3 feet and in - we experience such spastic movements? If you’re like me, you think that we’re supposed to make every 3-footer, and if we miss we will experience great shame. We think our playing partners will laugh and that we wont be able to face our families when we return home. On the other hand, the 30-footer with 5 feet of break on lightning fast greens causes us no issues at all. We put a smooth stroke on it and hope for the best. The two putts, while rather different, still count the same, yet we apply so much pressure to make the short one that it’s no wonder we end up trying to steer them into the hole for fear of missing. If we can remove our overwhelming focus on the end result, it will help to smooth out our stroke. Replace your attention on results with an attention to the process and routine. Whether it’s golf, business, or our relationships, we are wired to be overly focused on results and usually spend little to no effort focusing on our process and routine. When we emphasize our routine, we subconsciously assign the same value to every shot; helping us to avoid putting unwanted pressure on ourselves to execute what we perceive to be “easier” shots. The next time you’re out, accept the fact that you will be thinking about results. But instead of reacting to these thoughts, simply accept them and move on to focusing on your routine. You may find those 3-foot putts are no longer so daunting, and you may even enjoy yourself a little more on the golf course. Often times our strokes can get locked up when we over-analyze the break of a putt, or put too much emphasis on results (i.e. making the putt). When practicing and to help unlock your natural feel, practice putting for speed only. Place two balls a few feet away, creating a “gate.” Without reading any break at all, practice rolling your ball so it just makes it through the gate. Vary the distance of the gate until you feel comfortable with your distance control without feeling the need to hole a putt. Place three balls around the same hole so you have three, 5-foot putts. Step into the first ball, look at the hole, and make a stroke. Without waiting for the result, make a move to the next ball and follow the same procedure. The thinking behind this is that again we have taken the result out of the equation. We have added a specific target (the hole), but by moving on to the next ball– and preventing our waiting for a result – we can help free up our stroke. Now, the only focus is on a smooth stroke. These drills will help remove both the analysis and result-oriented pieces of your routine – both of which can cause tension and lead to shaky strokes. The more that we can train ourselves to react to our initial instinct without letting thoughts of fear and doubt creep in, the better chance we have at making a smooth, tension-free strokes. If you’d like something as a reminder when you go to driving range or golf course to help you get control of the putting yips, then download the bonus below. You'll receive a free step-by-step checklist that shows you the step-by-step process to help your yips. Have you ever been faced with an uphill bunker shot, and asked yourself how you should play it? This shot can certainly pose a lot of difficulty for golfers, but with good fundamentals and a sound technique, it’s definitely possible to get better and more consistent. Hi Sean, I’ve been having a lot of issues with my uphill bunker shot. Typically I come up short - and more often than not I leave my shots in the bunker. Do you have any suggestions or techniques that can help me improve? The first thing I would like you to examine is you club choice. The downhill bunker shot is one of the more challenging shots you’ll encounter on the golf course. We know that based on the slope, the ball will launch lower than normal. The main concern is getting the shot airborne quickly enough so that the ball carries the lip of the bunker and stays on the green. A sound technique will make this shot easier to play - with consistent practice leading to better results. Hi Sean, I have been having a lot of difficulty with downhill green side bunker shots. I really have no idea how I should play them. Could you please suggest some tips and share some information on how to play this type of shot? Brett, the first thing I want you to do is to address the ball so that your body is level with the gradient of the slope. Most golfers who I meet feel that they have a good grasp of how to play a greenside bunker shot - but what about long bunker shots? Do you hit the shot with a square face? For the purpose of this video, we’re going to define a long bunker shot as a shot anywhere from 40-60 yards in length. Applying a good technique can make this shot easier to execute, help you get the ball onto the green, and in time help make more sand saves. Hi Sean, I saw your video on the high bunker shot and my greenside bunker play has really improved. However, I’m still having a lot of issues with fifty yard bunker shots. Do you have any techniques or suggestions on playing this type of shot? Knowing how to hit a flop shot can be very beneficial, especially when you find yourself short-sided to a tight pin. You can use the flop shot in situations in which you need to get the ball up in the air quickly and have it land soft - with very little roll. Phil Mickelson makes the flop shot look easy because he follows a few basic steps every time he hits this type of shot. Hi Sean, I’ve been having some issues with my flop shots, especially when I have to go to a tight pin over a bunker. I find I often catch shots thin or heavy. Do you have any techniques or suggestions to help my consistency? Playing this shot is going to incorporate some of the same techniques and philosophies that we use with hitting a high bunker shot. First, we are going to take our set up and evenly distribute our weight fifty percent (50%) on the left leg and fifty percent (50%) on the right leg. Second, we want to make sure that we aim the body slightly left of the target, maybe two to three yards. If you find yourself just off the green or your golf ball has come to rest against the collar of the rough, what club would you normally use? Have you ever tried chipping with a hybrid? After reading this, you just may consider the hybrid. It’s a versatile club that can be used for more than just hitting full shots from the fairway or rough. Hi Sean, I was watching my club championship the other weekend, and one of the participants used his hybrids quite a lot around the greens. Is there a special way you like to play this shot?" I like to use the hybrid every now and then around the greens, and it is definitely a good shot to have when you need it. There are a couple of things that you need to know when chipping with a hybrid. In your setup, I would like to see your feet very close together. Because it’s such a short shot, we are not looking for any weight transfer at all. What exactly is the difference when it comes to chipping vs pitching? There is actually a big difference, and knowing the correct shot to play can save you anywhere from one to three strokes per round. Hey Sean, I have a lot of difficulty deciding the correct shot to play around the green. Sometimes I don't know if I should be playing a chip shot or pitch shot. Do you have you any advice? Before we get started, let’s first define what the difference is between a chip shot and pitch shot. The pitch shot is a high shot you would hit two-thirds of the way to the pin, and it would release the last third of the way. You would hit a chip shot lower and closer to the ground. With this shot, the ball would carry a third of the way to the pin, and release the other two-thirds. Now, a big part of deciding what shot to play is the first thing going to be the lie. Have you ever found yourself 20 yards short of the green? Perhaps you’ve hit two great shots just short of a par 5, or you have miss-hit your second shot to a par 4. You have a tight lie and you would like to have the ball land on the green and run out to the hole. How exactly do you execute a pitch shot that rolls up close to the hole and leaves you with a potential birdie putt or the ability to save par? Hey Sean, I have been having a lot of issues with my 20-yard pitch shots around the green. I have a tendency to catch them heavy or thin. Do you have any techniques on how to hit a pitch shot that will help me be more consistent? The most important part of getting more consistent with these 20-yard pitch shots is getting in a good setup from the start, and then establishing a good routine to help you repeat the same set-up over and over again. There are different techniques for hitting bunker shots, and today I would like to share with you how to hit a high bunker shot. What do you do if you need to hit the ball over an extremely high lip in front of you? Some people think that there is very little room for error when hitting these types of shots; but if you have the right technique, you will have your friends’ mouths wide open in awe. Hey Sean, my home course has extremely high lips on every bunker, and I really struggle to get out of them. Do you have any advice on how to get more height on my bunker shots? One thing all great bunker players have in common is how they use the bounce of the club when hitting out of the sand. This means the back of the club is the first part of the club to enter the sand when hitting sand shots, not the leading edge of the club. Have you ever thought about what part of your game could help you break 100 in golf? What if I told you it’s a lot easier than you might think? More importantly, what if I told you it doesn’t involve hitting three hundred yard drives? I’ve been playing golf for a few years now and I have still not broken 100. Do you have any tips or information from your experience that could help me achieve my goal? There are many different aspects of the game that you can work on to help you break 100, but the main thing I feel you should be focusing on the most is improving your speed - or distance control - putting. Do this to help you break 100 in golf….. 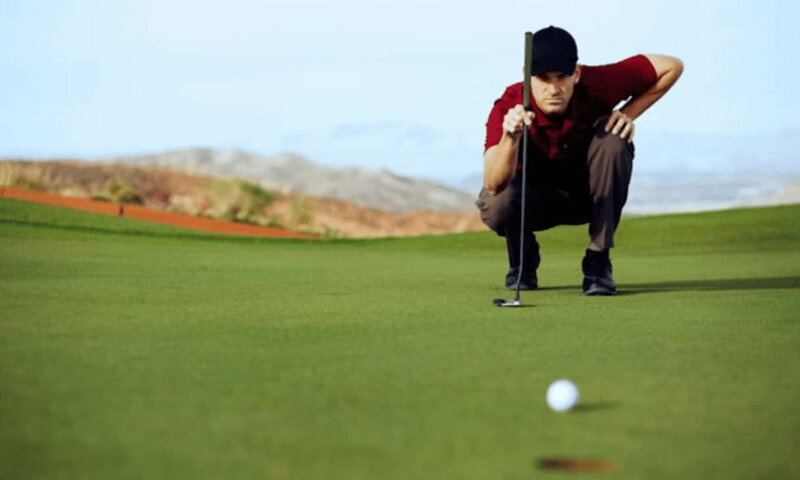 The part of your game I’d like you to stay focused on is the speed (or distance control) of your putts. I play with a lot of amateurs in pro ams who throw away numerous strokes on the green. What you don’t want to be doing is leaving putts five to six feet short of the hole, or hammering them five or six feet past the hole.